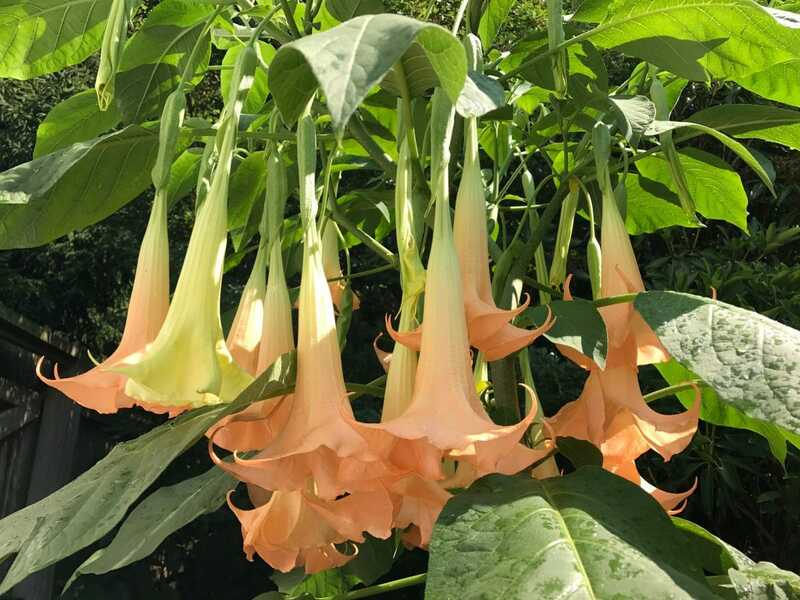 Brugmansia, commonly known as Angel’s Trumpet, is a group of seven plant species native to South America. Sadly, they are listed as extinct in the wild by the IUCN. A Brug’s gargantuan blooms are sweet and seductive and it does have hallucinogenic properties. Each flower measures an extraordinary 8 to 20 inches long, filled with an evening perfume that belies the plant’s toxicity. It’s safely cultivated by many gardeners – relax and enjoy the show, just don’t eat it! At the plant sale, the tall, skinny-girl Brugmansia trunks seemed far too weak to hold their umbrellas of over-sized tropical leaves. No blooms yet, but the promise of humungous trumpet-shaped, fragrant flowers was a compelling force – “buy me, buy me, I’m only $20.” The siren’s call was hard to resist. 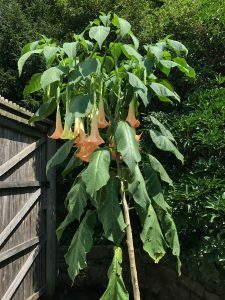 The Brugmansias were snatched up like wedding dresses on sale at Filene’s Basement. Truth be told, most customers had no idea what they were buying – the Brugs just looked really intriguing. Soon there were only five Brugs left, then four, then three and then just two. Time to make a decision. For $20 apiece, these tropical show stoppers seemed a bargain too good to pass up. Could I? Would I? Should I? 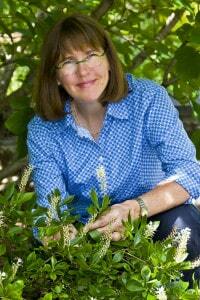 The conscience of a dyed-in-the-wool native plant evangelist runs deep. I went AWOL and put pure plant satisfaction ahead of ecological value. I’m a plant geek – I couldn’t help it. 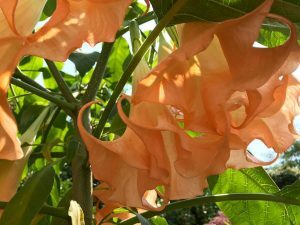 I had seen Brugmansias growing in Costa Rica and was immediately seduced by their blooms. Twenty dollars and 10 years later, I had my own Brug. After shelling out a twenty, I scrunched the five-foot exotic beast carefully into my car. Getting it out was worse – a lost leaf or two, a rip and a tear, it didn’t care, my Brug wanted to see its new home – my backyard patio, where it would soon dominate, holding court over my native perennials in containers. Did I mention that my Brug was only $20? Hmm… It seemed so cheap at the time. 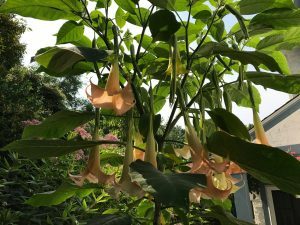 In my Angel Trumpet fever, I had forgotten the demands of fussy, non-native tropical plants. Spoiled by the carefree habits of my native plants, I now answered to a demanding new master. First purchase – a large new container to hold the Brug’s expanding roots, now outgrowing its tiny nursery pot. Next, a rolling plant caddy to move the beast around. Then, two large bags of organic potting soil to fill the voluminous new pot. And finally, organic fertilizer with a Brug-friendly N-P-K, to quell the Angel Trumpet’s constant hunger. Only the best for my Brug. I now own a $160 Brugmansia. Payback from the natural world. You stray, you pay. I don’t feel too badly about my exotic indulgence. The Brug’s flowers are breathtaking. Now, where the heck will I overwinter the damn thing? I grow Capensis radicans – much prettier, winter hardy and native. I think you are referring to Campsis radicans (Trumpet Creeper). I grow that too! It’s a wonderful, robust native vine, attractive to hummingbirds, that can cover a fence in no time. It’s also a nectar and host plant for some Sphinx moths. We have a number of showy native vines with impressive flowers that do so much more than look good. A favorite of mine is Lonicera sempervirens (Trumpet Honeysuckle) that has an extremely long bloom time, attracts hummers and some other long-tongued pollinators, is a host plant, and provides late summer/early fall fruit for migrating birds. These important ecological functions are why I focus on regional native plants, with an occasional indulgence, like my Brugmanisa. Thank you for helping me make this point! Just take cuttings (12-16 inches long) and put them in a lighted area in a bucket with water to overwinter. Note: Take them before frost or after a light frost. They will root and and grow shoots around Dec-Jan. In spring, after the last frost, pot them/plant them out and give the rest to friends. Easy. Ha ha! I read with interest because I succumbed to purchasing Brugsmania Charles Grimaldi which I plan to plant in the ground at my Florida home in zone 9 because well, I am like a kid in a candy store in zone 9 although I have planted mostly native plants. I am starting him here in my NY home (in zone 4) in a pot which, of course, he is quickly outgrowing. I am so excited to see those blooms. I am usually a native plant enforcer but, like you said, those flowers are breathtaking and I am a bit obsessed! I also have a beast of trumpet vine in the backyard here in NY.